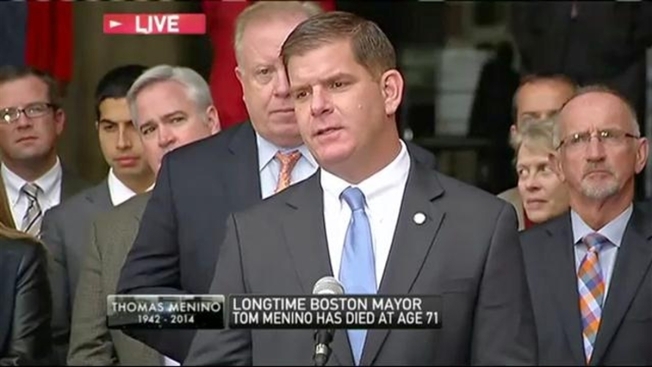 Mayor Marty Walsh solemnly addressed the city of Boston Thursday afternoon after hearing of the passing of former Mayor Tom Menino. "Boston mourns together," Mayor Walsh began. Walsh called on Menino's legacy, saying that no one possesses a greater love for the city of Boston. "His lifetime of dedicated service to Boston and her people changed the face of our city. With sheer determination and unmatched work ethic, he took a city that's not as big in size as we are in stature and he put us on a world stage," Walsh lamented. Walsh continued by saying Menino was a leader in health care, education, and innovation, as well as a leader in policies from environment to youth engagement and crime prevention. "More than anything, he was a man of the neighborhood," Walsh said. "He had a deep understanding of the powerful impact that municipal government has on peoples lives. He made sure government served the people, not the other way around." Walsh also talked about the tragedy of the Boston Marathon bombings and how Menino continued to put the city first even in the wake of his personal illness. Menino's Legacy as the "Mayor Next Door"
"He had a heart big enough for everyone in our city. That love was never shown more than after the tragedies of Marathon Monday where he pulled himself out of a hospital bed two days after emergency surgery to be with the people, to make tough decisions, to comfort the suffering and the grieving and all of the people in our city of Boston," Mayor Walsh recalled. In addition, Walsh said that Mayor Menino should be most proud of personally meeting so many Boston citizens. Menino died at age 71 on Thursday, less than a year after leaving his 20-year post as mayor of Boston.